When the bones of two early humans were found in 1967 near Kibish, Ethiopia, they were thought to be 130,000 years old. Towards the end of the twenty-first century, researchers found 154,000 to 160,000 year-old human bones at Herto, Ethiopia. 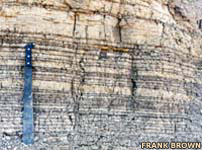 Geologist Frank Brown, a co-author of the study and dean of the University of Utah's College of Mines and Earth Sciences, was of the opinion that it pushed back the start date for anatomically modern humans. Published in the journal Nature on 17 February 2005, Brown conducted the research with geologist and geochronologist Ian McDougall of the Australian National University in Canberra, and anthropologist John Fleagle of New York state's Stony Brook University, USA. The researchers dated mineral crystals in volcanic ash layers above and below layers of river sediments that contained the early human bones. They concluded that the fossils were much older than a 104,000 year-old volcanic layer and very close in age to a 196,000 year-old layer. At the time - 2005 - they were the oldest well-dated fossils of modern humans (Homo sapiens) known anywhere in the world. Pushing back the emergence of Homo sapiens from about 160,000 years ago to about 195,000 years ago was significant because the cultural aspects of humanity in most cases appear much later in the record - only 50,000 years ago - which would mean 150,000 years of Homo sapiens without cultural materials, such as evidence of eating fish, of harpoons, anything to do with music (flutes and other musical instruments), needles, and even tools. Such developments all came in very late, except for stone knife blades which appeared between 50,000 and 200,000 years ago, depending on which archaeologist you believe. There was (and still is) a huge debate in archaeological literature regarding the first appearance of modern aspects of behaviour, such as bone carving for religious reasons, or tools (harpoons and other items), ornamentation (bead jewellery, for example), drawn images, or arrowheads. They only appeared as a coherent package about 50,000 years ago, and the first modern humans to emerge from the area of the Middle East nearest to Africa between 50,000 and 40,000 years ago seem to have had the full set. As modern human anatomy is documented at earlier and earlier sites, it becomes evident that there was a great time gap between the appearance of the modern skeleton and 'modern behaviour'. The study moved the date of human skulls found in Ethiopia's Kibish rock formation in 1967 back from 130,000 years to a newly determined date of 195,000 years ago, give or take five thousand years. Fossils from an individual known as Omo I look like bones of modern humans, but other bones are from a more primitive cousin named Omo II. In addition to the cultural question, the earlier date for humanity's emergence is important for other reasons. Ethiopia's River Omo flows below bluffs of the Kibish rock formation, where scientists first excavated the bones of early humans in 1967 and estimated that they were 130,000 years old. But in a 2005 study, scientists determined that those bones and newly excavated fossils actually were from humans who roamed the area 195,000 years ago. The study was funded by the National Science Foundation, the LSB Leakey Foundation, the National Geographic Society, and the Australian National University. Firstly, it makes the dates in the fossil record almost exactly concordant with the dates suggested by genetic studies for the origin of modern man. Secondly, it placed the first appearance of modern Homo sapiens in Africa many more thousands of years before our species appears on any other continent. It lengthens that gap. 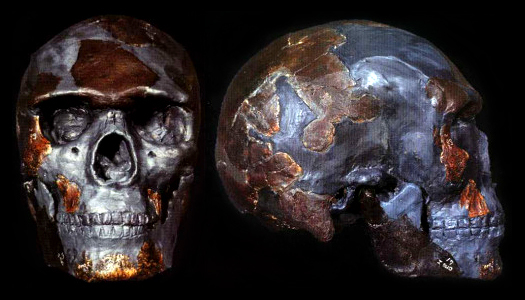 Finally, the similar dating of the two skulls indicated that when modern humans first appeared there were other contemporary populations - such as Omo II - that were less modern. In 1967 Richard Leakey and his team of palaeontologists travelled to the Kibish Formation along the River Omo in southernmost Ethiopia, near the town of Kibish. They found the skull (minus the face) and partial skeleton (parts of arms, legs, feet, and the pelvis) of Omo I, and the top and back of the skull of Omo II. Brown was not part of the 1967 expedition, but was working nearby and got to look at the site and the fossils. Anthropologists at the time were noting how very different they looked in their evolutionary status. Omo I essentially appeared to be modern Homo sapiens, and Omo II appeared to be more primitive. In 1967, the fossils were dated at 130,000 years old, although the scientists doubted the accuracy of their dating technique, which was based on the decay of Uranium 238 to Thorium 238 in oyster shells from a rock layer near the skulls. No scientist has been bold enough to suggest that Omo II is anything other than Homo sapiens. Instead, it is quite often the case that, at the time of major events in evolution, one finds an increase in morphological - anatomical - diversity. With the 2005 study confirming Omo I and Omo II as being the same age, living within a few hundred years of each other at about 195,000 years ago, some anthropologists suggested that Omo II perhaps was not so primitive after all. McDougall, Brown, and Fleagle and researchers from other universities returned to Kibish in 1999, 2001, 2002, and 2003. 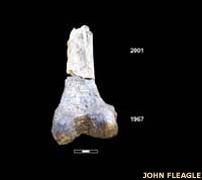 They identified sites at which Omo I and Omo II were found in 1967, and obtained more of Omo I, including part of the femur (upper leg bone) that fitted to a piece found in 1967. They also found animal fossils and stone tools, and studied local geology. The 2005 study included initial results from those expeditions. The fossil record of human ancestors may go back six million years or more, and the genus Homo arose at least 1.8 million years ago when australopithecines evolved into potential direct-line human ancestors known as Homo habilis (see the Hominid Chronology for details). The fossil record for humans is poor between 100,000 to 500,000 years ago, so Omo I is significant because it is well dated. Both Omo I and Omo II were buried in the lowermost portion or 'member' of the Kibish Formation, a series of annual flood sediments laid down rapidly by the ancient River Omo on the delta around where it once entered Lake Turkana. Lake levels now are much lower, and the river enters the lake about a hundred kilometres (sixty miles) south of Kibish. The formation is a hundred metres thick (330 feet), and is divided into at least four members, with each of the four sets of layers separated from the other by an 'unconformity', which represents a period of time during which rock eroded away instead of being deposited. 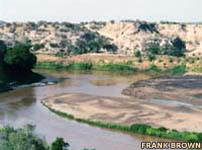 For example, the lowermost Kibish I member was deposited in layers as the River Omo flooded each year. After thousands of years, rainfall diminished, lake levels dropped, and the upper part of Kibish I eroded away. Later, the lake rose and deposition resumed to create layers of Kibish member II. Interspersed among the river sediments are occasional layers of volcanic ash from ancient eruptions of nearby volcanoes. Some ash layers contain chunks of pumice, which in turn contain feldspar mineral crystals. Feldspar has small amounts of radioactive Potassium 40, which decays into Argon 40 gas at a known rate. The gas, trapped inside feldspar crystals, allows scientists to date the feldspar and the pumice and ash encasing it. Omo I Distal Femur (upper bone in the knee joint). Potassium-argon dating shows that a layer of ash no more than three metres (ten feet) below Omo I's and Omo II's burial place is 196,000 years old, give or take two thousand years. Another layer is 104,000 years old. This one is almost fifty metres (160 feet) above the layer that yielded the Omo humans. The unconformities represent periods of time in which rock was eroded, so that the fossils must be much older than the 104,000 year-old layer and close in age to the 196,000 year-old layer. The clinching evidence comes from sapropels, which are dark rock layers on the Mediterranean sea floor that were deposited when floods of fresh water poured out of the River Nile during rainy times. No other sediments on land have been found to record wet and dry periods that correlate so well with the same climate pattern in ocean sediments. The 2005 study found that the 'members', or groups, of rock layers in the Kibish formation were laid down at the same time as the Mediterranean sapropels. In particular, the volcanic layer right beneath Omo I and II dates to 196,000 years ago by potassium-argon dating, and corresponds almost perfectly to a sapropel layer previously dated as 195,000 years old. The study team members decided that it was pretty conclusive, disputing any contention that the fossils may be younger than 195,000 years old. Images (where noted) and text copyright © University of Utah Public Relations. No breach of copyright is intended or inferred.